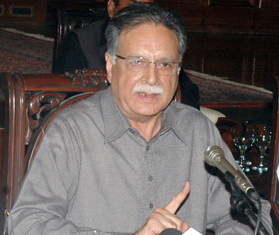 Federal Minister for Information Pervez Rashid has said that probing into the result of four constituencies was a judicial matter and not political. Talking to a private TV channel Saturday, Rashid held that politics of storming was not a service to democracy. Such politics was tantamount to undermining democracy, he underlined. “Why are the electoral results of 2013 not suiting those who had accepted rigging-ridden referendum and elections in the past,” he inquired, adding that Pakistan Tehreek-e-Insaf (PTI) chief Imran Khan was ruling Khyber Pakhtunkhwa due to the elections which he was dubbing as rigged. The minister went on to saying that public meetings and processions could not affect the government. Any interference by state machinery in the polls was not possible, he said, adding that Khan should focus on improving the performance of his government in KP rather than indulging in criticism.